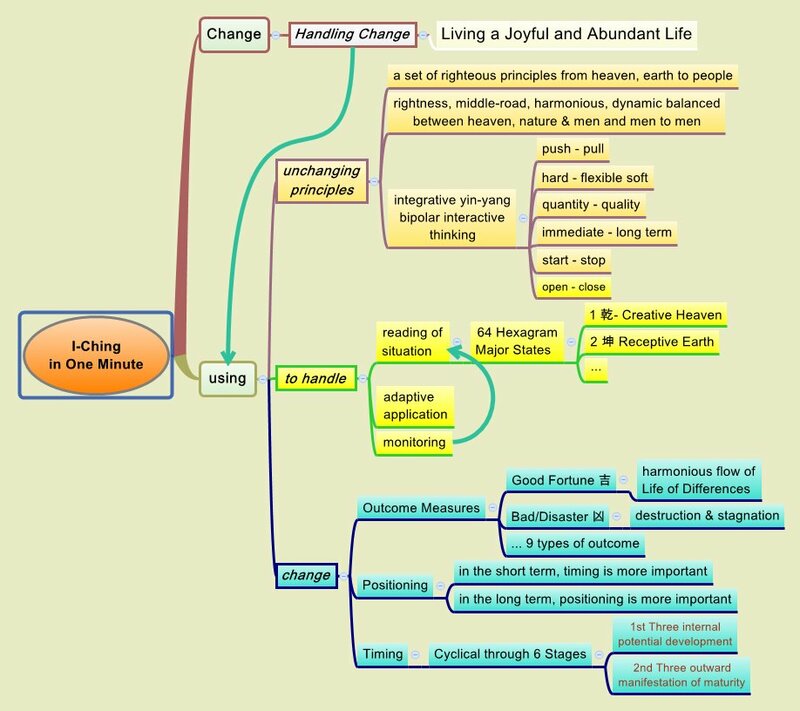 Many people heard about i-Ching, the Book of Change, from the Chinese and want to know more about it. While it is a short book in the original Chinese language, it is highly codified and very rich in content. Here is an attempt to explain it in One-minute. I-Ching in one word is “Change“. It is clearer in two words, “Handling Change“. It is about being able to meet life ever changing situations and handling them well and so able to live stress-free, with abundance and vitality. It is about achieving harmony with heaven, earth, and fellow men. They are based on the ways of working of Heaven and Earth and applying to men for living harmoniously and productively together. It is righteousness based and middle-of-the way of dynamic balanced. The balanced position is not fixed but changes with time and the interactions. It is not either A or B but both A and B in different degree. It is win-win innovative thinking. To handle change, we must know how to measure the states of changes. What good or bad is. I-Ching outcome measures in most simplified form are either Good Fortune 吉 or Bad/Disaster 凶. Good is defined as “harmonious flow of life of differences”. Life is about the vital interaction of differences and of not uniformity where there is no interaction. No interaction is dead. The key is Harmony, not uniformity. It is very relevant to today world of globalization where different cultures interact to live in peace and harmony. The situation is observed is states (64 hexagrams, e.g. 04 蒙 Naive – Learning, 06 訟 Litigation, 36明夷 Darkening, 11泰 Great-Vibrant Flow etc), time and position. For timing, it is cyclical, going through 6 stages into another state. For the short term, timing is more important. But in the long term, it is the positioning that becomes more important in determining the outcome. To handle change, we must know how to describe the state of a situation. I-Ching has 64 hexagrams to describe the main states. The two foundational states are 1 乾- Creative Heaven(all Yang) and 2 坤 Receptive Earth(All Yin). The other 62 states are various extent of interactions of the main Yin and Yang forces. Handling is then the wise and adaptive applications of the principles to cause the change to move in the direction that one wishes. It is a flexible application of principles and not one fixed rule to handle all situations. Contrary to the popular misunderstanding that i-Ching is a book about fortune telling, i-Ching tells you that you hold your fate in your hand. You are responsible for your own life. This is because the outcome of good and bad can be determined from our action according to the teaching of i-Ching. For a given situation, if i-ching tells you that doing this will bring a bad result, then we should wisely take the heed to NOT do it and give a good outcome instead of the predicted bad outcome. What if I know I should but I can’t? Many people fail not because they don’t know but because they can’t. We have the famous Bible word that “the spirit is willing but the flesh is weak”. We have a mind and also a heart. The mind knows what is right. But the heart, the motivation, just can’t bring itself to do it. We can try to by reading, reminding, and meditating on the teaching of i-ching so that we can feel the goodness or badness if we don’t follow the right moves. Otherwise, i-Ching does not provide you the will to follow or even learn of its teaching. The answer on the will and motivation is found elsewhere. I found it in the Bible. Rom 7:25 Thanks be to God—through Jesus Christ our Lord! The full passage is Rom 7:18-25. 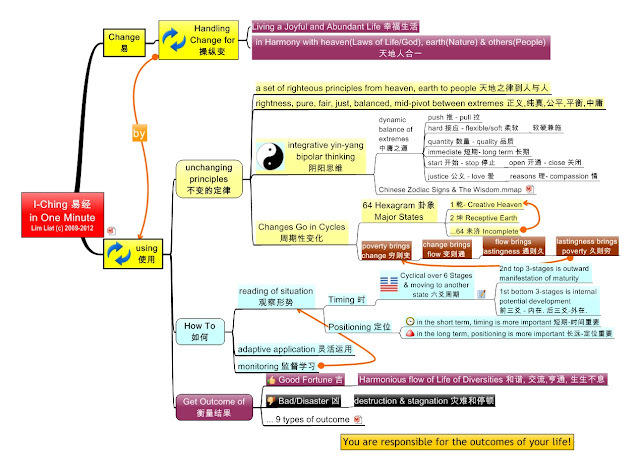 Update 7 Feb 2012 i-Ching in One Minute with Chinese. 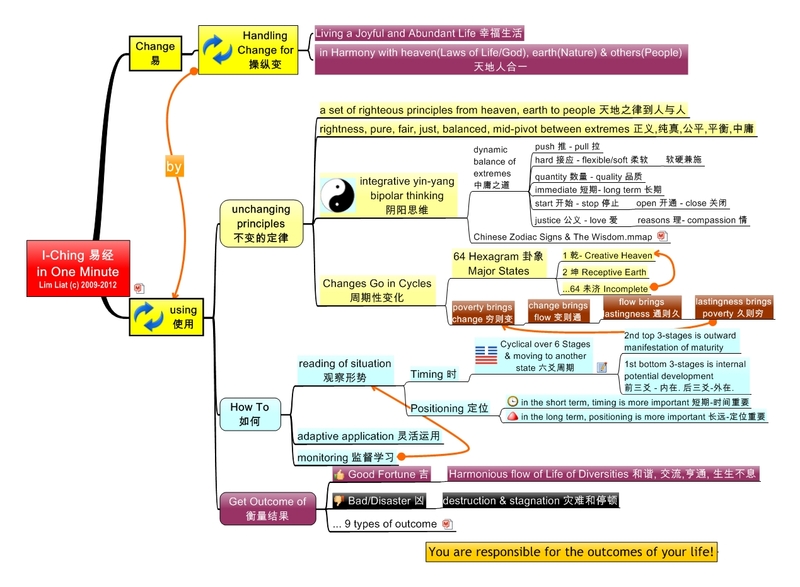 This entry was posted in I-Ching, Leadership, Thinking Skills by limliat. Bookmark the permalink. Pingback: What Is Ancient Chinese Wisdom?